Welcome to SO SO Into It Academy. 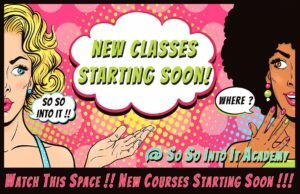 At SO SO Into It Academy I offer small, personal classes. Our classes never have more than 4-6 students. This means personal, one-on-one training. I have enough time for each student to make sure that you truly understand the theoretical training, and that you learn the practical skills until you are fully competent. All the classes are offered by myself. I am a Graduate Fashion Designer. I bring decades of experience, in life and business! SO SO Into It Academy provides people with a space to learn Fashion Design, Sewing Skills and Pattern Making. My goal is to empower people with the knowledge the need to decide and make their own Future.